The Cross in Our Bodies. A couple of days ago I was running (I use that term very loosely) on my treadmill, watching a DVD sermon by Louie Giglio… And I was BLOWN AWAY! I want to share what I learned…. He (Louie) was talking about how inconceivably BIG our God is… How He spoke the universe into being… How He breathes stars out of His mouth that are huge raging balls of fire.. Etc. Etc. Then He went on to speak of how this star-breathing, universe creating God ALSO knitted our human bodies together with amazing detail and wonder. Louie went on to talk about how we can trust that the God who created all this, also has the power to hold it all together when things seem to be falling apart…how our loving Creator is also our sustainer. And then I lost my breath. And it wasn’t because I was running my treadmill, either!!! It was because he started talking about laminin. 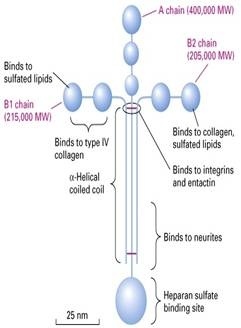 I knew about laminin… ‘Laminins are a family of proteins that are an integral part of the structural scaffolding of basement membranes in almost every animal tissue’ You see…. Laminins are what hold us together… LITERALLY. They are cell adhesion molecules. They are what holds one cell of our bodies to the next cell. Without them, we would literally fall apart. And I knew all this already. But what I didn’t know is what they LOOKED LIKE. But now I do. And I have thought about it a thousand times since (already)…. 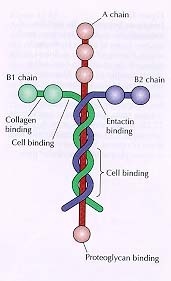 Here is what the structure of laminin looks like… AND THIS IS NOT a ‘ Christian portrayal’ of it…. If you look up laminin in any scientific/medical piece of literature, this is what you will see…. Now tell me that our God is not the coolest!!! Amazing. The glue that holds us together…. ALL of us….. Is in the shape of the cross. Immediately Colossians 1:15-17 comes to mind. Call me crazy. I just think that is very, very, very cool. Thousands of years before the world knew anything about laminin, Paul penned those words. And now we see that from a very LITERAL standpoint, we are held together… One cell to another…. By the cross. 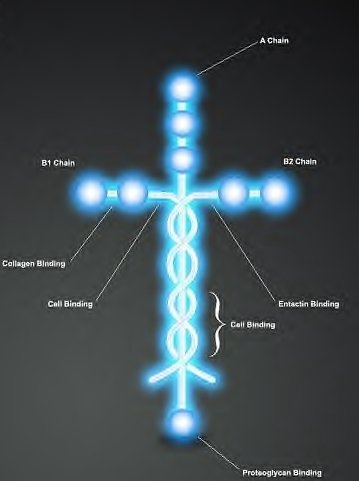 You would never in a quadrillion years convince me that is anything other than the mark of a Creator who knew EXACTLY what laminin ‘glue’ would look like long before Adam breathed his first breath!! 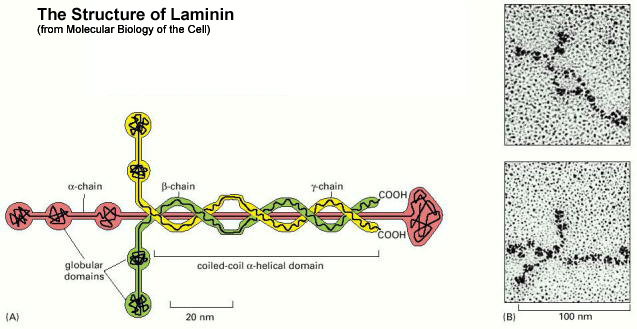 What I found when I googled laminin !!!!!!!!!!! The cross is supposed to be swinging when you receive this. I hope it still is. This is cool – I had to pass it on. I think we could all use a miracle. I know I certainly can! “I believe in the sun even if it isn’t shining. I believe in love even when I am alone. FOOTNOTE: The author of this piece is unknown to me, but the content was worth re-posting so that others can can read it. This is NOT my work. ← Where did the Texas Longhorns logo idea come from?